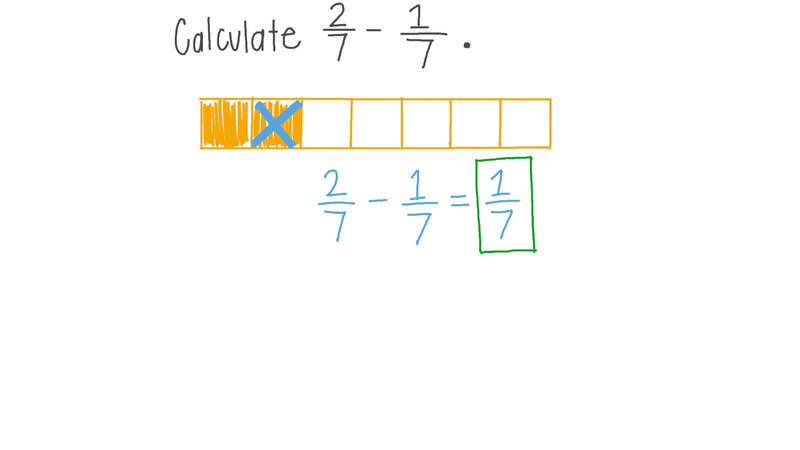 In this lesson, we will learn how to subtract fractions with common denominators and use this to solve real-world problems. Calculate 2 7 − 1 7 . What number gives 5 9 when it is subtracted from 8 9 ? What is the difference between 6 1 0 0 and 4 1 0 0 ? To prepare her morning drink, Yara mixed of a cup of carrot juice with of a cup of orange juice. How many more cups of orange juice than carrot juice did Yara use? In Mr. Adam’s class, of the students finished their homework, whereas, in Mr. Bassem’s class, of the students finished their homework. How many more of the students finished their homework in Mr. Adam’s class than Mr. Bassem’s? Find two fractions that have a difference of 1 9 and denominator that are not 9. At a school, a group of students signed up for different classes. Using the table, determine the fraction of students that signed up for art, music, and wood working and the difference between that fraction and the fraction of students that signed up for philosophy. How much longer is 4 7 of a foot than 1 7 of a foot? In a particular year, from January to March, Death Valley received a total of about 2 1 2 5 of an inch of precipitation. From April to June, it received a total of about 6 2 5 of an inch. How much more precipitation occurred in January to March than in April to June? The pie chart shows the favorite sports of students in Brown Middle School. What fraction of students chose either basketball, baseball, or football as their favorite sport? What is the difference between the fraction of students who did not choose soccer as their favorite sport and the fraction of students who did choose soccer? What number gives 1 7 when 2 7 is subtracted from it? Complete the following: 4 7 − = 3 7 . 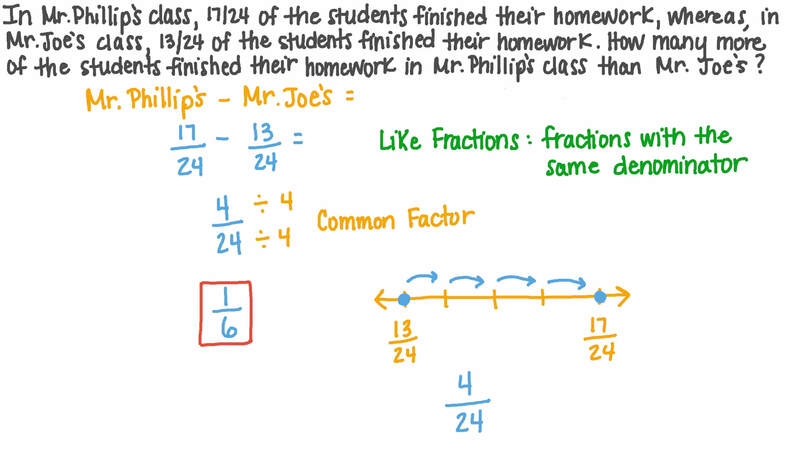 Rania wants to calculate by first writing each fraction over the same denominator. Which of the following is the next step she should take? Calculate 7 1 5 − 2 1 5 . How much longer is 5 8 of a foot than 1 8 of a foot?